My wife and I just watched Hidden Fortress this week, and I wanted to share a few thoughts. First, in the interview with George Lucas on the DVD, I found out that this movie provided a bit of inspiration for Star Wars. But it didn't inspire Lucas in what might be the more obvious aspects, such as smuggling a princess through enemy territory. What Lucas said was "the strongest influence" was the telling of the story from the perspective of the "two lowliest characters." In Star Wars, of course, those two are the robots R2-D2 and C-3PO (I'm always catching myself saying "3-CPO" instead of "C-3PO"). 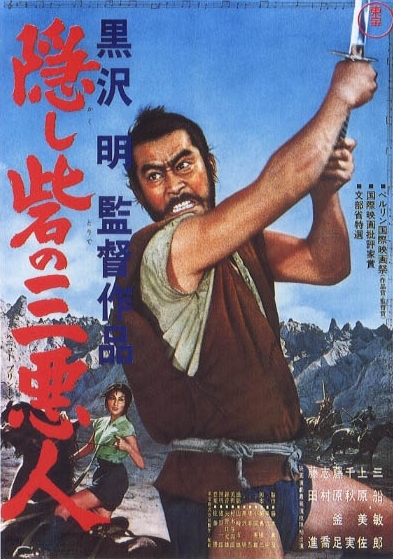 In Hidden Fortress, two peasants named Tahei and Matashichi provide the perspective on the whole adventure (and most of the comedy). The final scene is both inspiring and humorous. Throughout the movie, Tahei and Matashichi are fighting over the gold that belongs to the princess' clan and that is protected by the general taking her to safety (with the help of the peasants). Their friendship is on (when they've temporarily lost the gold or find themselves in a tight spot) and off (when one of them stumbles upon another piece of gold or a plot to run away with it all). At the end (SPOILER ALERT), the princess and General Makabe give Tahei and Matashichi one piece of gold--and tell them to split it. So as they leave the palace, Tahei offers the gold to Matashichi, who tells him to keep it. They agree for Tahei to keep it in the end. But with all the foregoing spats throughout the movie, the viewer knows they'll fight again. Quite human in a lot of ways.